Put it in a Docker image and ship it with Artifactory. The ever growing popularity of Docker’s container technology has brought thousands of different images to be offered on Docker Hub. As a commercial feature, Docker private registries can provide enterprises with access control to their internal images, however, JFrog has recognized that enterprises may not be satisfied with the security that can be offered by images stored in the cloud. Using local repositories, Artifactory gives you a central location to store your internal Docker images just like Docker Hub Enterprise. When all teams know that any image can be accessed from a single URL, access to local images and managing them between the different teams becomes very easy. And if you need to share your image with colleagues in geographically remote sites, Artifactory supports replication to another instance of Artifactory that is outside of your local network. By using a local repository within Artifactory, enterprises can exceed the security offered by Docker private registries and enjoy fine-grained access control to their images. As a first line of defense, Artifactory lets you use naming patterns to define “Excludes” and “Includes” for access. Then you can assign different sets of permissions to users and groups. You can also use Artifactory’s integration with LDAP, Active Directory, SAML, Crowd and others to control access to your servers. Using Artifactory instead of Private Repositories on Docker Hub removes any issues related to internet connectivity. When all of your Docker images are accessed through local repositories in Artifactory, connectivity is never a problem. Artifactory provides you with flexible search capabilities to help you find any Docker images stored in your system. First, Artifactory supports the Docker Registry API so your most basic search for images is done in exactly the same way you are used to using the Docker Registry. But Artifactory offers much more. Artifactory comes with a set of common built-in searches. For example, you can easily find the “latest” version of any image without having to specify a version number. And the full power of search with Artifactory comes through custom properties. Artifactory lets you assign any set of properties to your images, which can later be used for search. With all these capabilities, Artifactory’s flexible smart search lets you search for Docker images using virtually any set of rules relevant to your workflow. Fully automate your software distribution pipeline using Artifactory to host your Docker images from development through deployment. Once your images are ready for distribution, automatically upload them to Bintray using Bintray’s REST API. 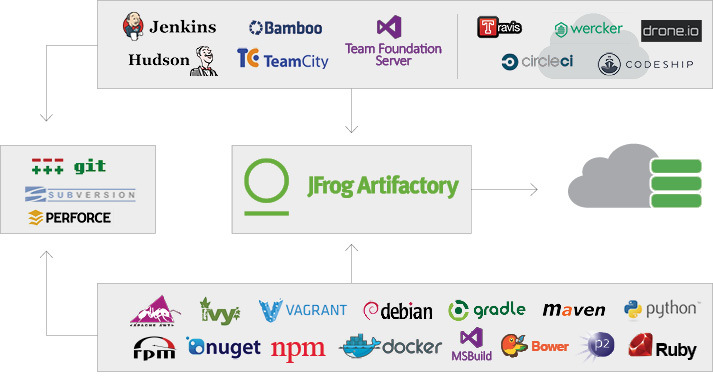 As a fully-fledged Docker registry, Artifactory offers image management and security features that meet the needs of enterprise Docker users.